Set to complete the feature adaptation of Stephenie Meyer's final book in the Twilight series, Breaking Dawn Part 2 will have Bella adjusting to being a new vampire and determined to protect her family, including her and Edward's new daughter Renesmee, from the dangerous and powerful Volturi vampires. MTV posted the two photos below, the first of which has Robert Pattinson as Edward as he travels to visit the Denali coven, in the hopes that they'll join the Cullens against the Volturi. And in this one, Edward and Bella (Kristen Stewart) are standing with representatives from the Denali and Amazon covens. 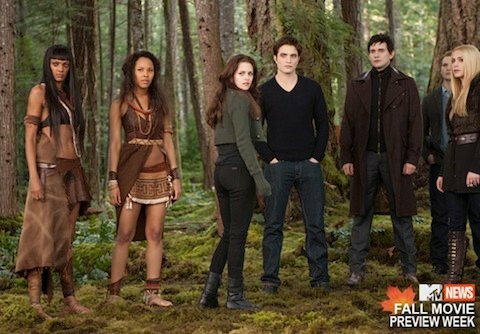 In addition to the above photos, MTV also ran an interview with director Bill Condon, who talked about the progress on getting Breaking Dawn Part 2 finished. We're at the stage of mixing and doing color timing and adding that last big bunch of visual effects shots, and that's where it gets complicated because the [most challenging] ones always come in last, so it's just making sure that they look as good as they can, that's the big thing right now. He also mentioned that the film will run an hour and fifty-six minutes, which is one minute shorter than Breaking Dawn Part 1 (117 minutes), and will also make it the shortest of all of the films (Eclipse was 124 minutes, New Moon was 130 minutes and Twilight was 122 minutes), though not by much. 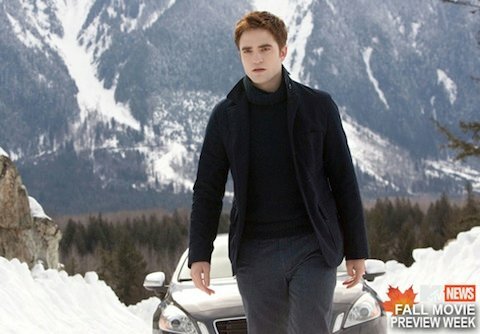 The Twilight Saga: Breaking Dawn Part 2 arrives in theaters November 16. More information, photos and videos can be found in our Blend Film Database.